In 1947, Great Britain relinquished to the UN the power to make decisions relating to the status of the Land of Israel. The General Assembly appointed a special committee that collected evidence and decided unanimously that Israel should be granted independence. On 14 May 1948 the State of Israel was proclaimed according to the UN partition plan (1947). Less than 24 hours later, the regular armies of Egypt, Jordan, Syria, Lebanon and Iraq invaded the country, forcing Israel to defend the sovereignty it had regained in its ancestral homeland. In what became known as Israel's War of Independence, the newly formed, poorly equipped Israel Defense Forces (IDF) repulsed the invaders in fierce intermittent fighting, which lasted some 15 months and claimed over 6,000 Israeli lives (nearly one percent of the country's Jewish population at the time). This Map Shows The 1948 Invasion Of Israel. The 1948 Arab–Israeli War, known by Israelis as the War of Independence or War of Liberation and by the Arabs as the Catastrophe. On 14 May 1948, David Ben-Gurion declared the independence of the state of Israel, and the 1948 Palestine war entered its second phase, with the intervention of several Arab states' armies the following day. The war commenced upon the termination of the British Mandate of Palestine in mid-May 1948 following a previous phase of civil war in 1947–1948. After the Arab rejection of the 1947 United Nations Partition Plan for Palestine (UN General Assembly Resolution 181) that would have created an Arab state and a Jewish state side by side, five Arab states invaded the territory of the former British Mandate of Palestine. Egypt, Iraq, Jordan, Lebanon and Syria attacked the state of Israel, leading to fighting mostly on the former territory of the British Mandate and for a short time also on the Sinai Peninsula and southern Lebanon. During the first few months of 1949, direct negotiations were conducted under UN auspices between Israel and each of the invading countries (except Iraq which has refused to negotiate with Israel to date), resulting in armistice agreements which reflected the situation at the end of the fighting. 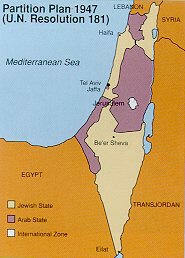 Accordingly, the coastal plain, Galilee and the entire Negev were within Israel's sovereignty, Judea and Samaria (the West Bank) came under Jordanian rule, the Gaza Strip came under Egyptian administration, and the city of Jerusalem was divided, with Jordan controlling the eastern part, including the Old City, and Israel the western sector. Sometimes the term "green line" is used instead of Armistice Line. At the same time, Palestinian Arab fedayeen launched cross-border infiltrations and attacks on Israeli civilian centers and military outposts from Egypt, Jordan and Syria. Arab infiltration and Israeli retaliation became a regular pattern of Arab-Israeli relations. In July 1956, Egyptian President Gamal Abdel Nasser nationalized the Suez Canal, threatening British and French interests in oil supplies and western trade. Their interests converging, Israel, Britain and France planned an attack on Egypt, with the former seeking free navigation through international waters and an end to terrorist attacks and the latter two hoping to seize control of the Suez Canal. The Six-Day War of June 5–10, 1967 was a war between Israel and the neighboring states of Egypt, Jordan, and Syria. The Arab states of Iraq, Saudi Arabia, Sudan, Tunisia, Morocco and Algeria also contributed troops and arms. On May 15, Israel's Independence Day, Egyptian troops began moving into the Sinai and massing near the Israeli border. By May 18, Syrian troops were prepared for battle along the Golan Heights. At the war's end, Israel had gained control of the Sinai Peninsula, the Gaza Strip, the West Bank, East Jerusalem, and the Golan Heights. The number of Israelis killed were 983, and 4,517 were wounded. 46 Israeli aircraft were also destroyed. 15 Israeli soldiers were captured. Over 9,800 Egyptian soldiers were listed as killed, wounded or missing in action. In an effort to force Israel to unilaterally surrender captured lands, Egypt and Syria jointly attacked Israel on October 6, 1973, on Yom Kippur, the holiest day of the Jewish calendar. Other Arab states contributed troops and financial support. Caught by surprise, Israel suffered severe losses in human life and equipment. Following an Egyptian refusal to accept a cease-fire and a Soviet airlift to the Arab states, the U.S. sent an airlift to Israel enabling her to recover from earlier setbacks. Saudi Arabia then led the Arab world in an oil embargo imposed on the United States and other western nations. In the years following the 1973 war, Israel's enemies realized that they could not defeat Israel on the battlefield. They turned therefore to diplomatic warfare and sought to weaken Israel's international diplomatic position. Due to pressure from the Arab world, most African and third world countries broke diplomatic relations with Israel. 2). ADL (http://www.adl.org/ISRAEL/Record/sinai.asp) - Anti Defamation League.